Reviewed on Xbox One, also available on all other platforms. Straight off the bat this game has my gaming senses all tingling, for me this is what gaming is most definitely all about, couch co-op fighting games with all out action ……..or isn’t it? Let’s read on a bit deeper into the review to see if you really can judge a book by its cover. The story itself isn’t one of the most elaborate ones I’ve faced; it’s a case of every man (or ninja) for himself in the ultimate battle for the Jade Katana. You have a choice how you play either fight alone, team up or take on friends in brutal arena combat where death and dishonour is the ultimate price you pay. The year is 199x and the world is on the brink of destruction. The Jade Katana has been stolen and its power can only be so lethal that in the wrong hands humanity will fall. And so its down to the Viper Clan, sworn guardians of the Jade Katana to embark on their most risky mission yet: BRING BACK THE KATANA AT ALL COSTS. You use all the weapons available to you from katanas to bazookas as you battle your way to become the ultimate ninja and fulfill the ancient vow of the Viper Clan. The game offers you three modes to choose from; arcade, versus and infinite. Arcade is your straight forward “story” mode; I use the term story loosely as there is very little in storytelling, there is no cinematic cut scenes here. Versus is your player versus player grudge match to the death, there is no option for online multiplayer… this is back to the roots “sit next to your pals” multiplayer. Lastly Infinite is exactly what it says on the tin, you keep going and going until you die. 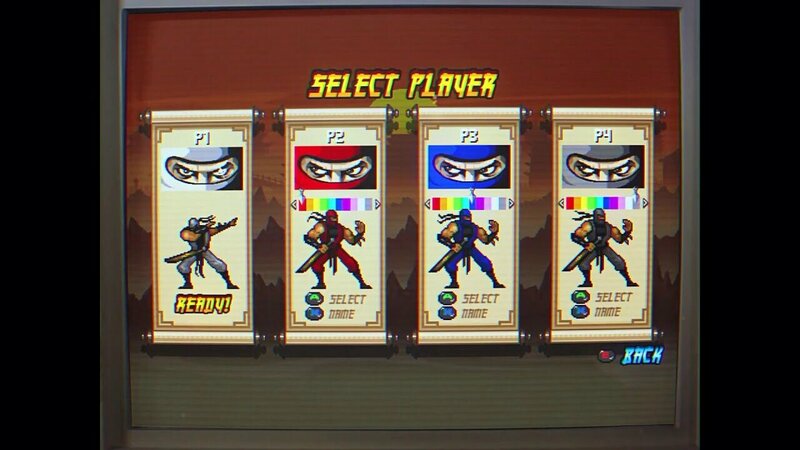 Starting off at Arcade you get taken to the next screen where you are able to choose your ninja (as you are told by awesome over the top voice straight from the early 90s), you are also able to customise your ninja by changing name and choosing the colour of you suit. Now then off we go into level 1, the action is there right from the start and so is the frustration, as although the first wave is pretty simple, all it takes is a slight touch from the enemy and you die, and as the speed of your ninja is quite fast you lose your lives quite quickly at first. Random boxes appear to give you more shurikens or special guns and bombs these prove quite valuable as they are one shot kills on most enemies, although you may want to reserve these for the harder waves that are harder to kill. A few levels in and my frustration levels are at a high, having slammed my controller down countless times already in rage; doing this game solo is nigh on impossible. My advice would be to get a second player on board as soon as you can, even if it’s just to save your sanity. Thankfully I have my son to step into the fold. We paired up in co-op mode and battled wave after wave of enemies, we did keep dying but the frustration quickly turned to fun and became a lot more enjoyable. Versus is in my eyes where this game excels the most, there’s no team death match, no online shenanigans, this is all out get your mates (or in this case my son) round crack open the beers and fight to the death. Versus takes you to the same customising screen as Arcade (and so does Infinite) to choose your character. Once you’ve done that… LET BATTLE COMMENCE. You have a time limit to get the most kills, although a warning when you die you also lose your points and the player with the most points when the time runs out wins. This is where the competitive streak in you will come out as you vey to beat your friends and claim full bragging rights, now this is multiplayer. Lastly you have Infinite mode where you start at the lowest level and the enemies keep coming and coming getting harder and more of them as it goes. Although enjoyable this is also frustrating as you still have the one touch kill from the enemy so you have to have your wits about you to succeed. The graphics of Ninja Shodown are what they are. If you looking for some realistic graphics and cinema style cut scenes then stay away from this, but if you are like me, of that age where you find the style of this somewhat nostalgic, then it’s most definitely worth the price tag. The soundtrack of the game is awesome, the music fits the style and the over the top voiceover just makes the game for me. To conclude my thoughts of Ninja Shodown, the difficult gameplay kind of ruins the single player mode for me, however this multiplayer side of the game more than makes up for it and saves the game. All in all, I enjoyed the game and will be playing more multiplayer with my son many times over soon.